Kowan O'Keefe is a Canadian citizen from British Columbia, and a senior Chemistry and Mathematics major at Minot State University in North Dakota. Kowan has a very keen interest in climate change, and in particular, legislation geared towards mitigating the effects of climate change. He is actively involved in organic chemistry research under Dr. Mikhail Bobylev as well as applied mathematics research under Dr. Narayan Thapa. Over the last two years, he has presented his research a number of times, most notably at the ACS national meeting in Dallas and at Posters on the Hill in Washington, D.C. At Minot State, Kowan plays on the varsity golf team and last season he was named to the NCAA Division II Academic All-America Team. In his spare time, he enjoys golfing, playing hockey, reading, and traveling. Jess McDonald is a first-year Masters in Environmental Management Candidate concentrating in Energy and the Environment at Duke University, NC. She previously attended the University of Pittsburgh where she recieved her BA in Environmental Studies and a Global Studies Certificate in Sustainable Development. Her passions lie in understanding the complex and vital relationship between our energy landscape and mitigating climate change. She is interested in how this relationship affects both national security and vulnerable environments. A second passion of hers is responsible resource use as it relates to corporate and social sustainability. In her free time Jess enjoys practicing photography, reading National Geographic and trying as many new foods as possible. Nina Diklich is a junior at Aquinas College in Michigan studying chemistry with minors in biology and mathematics. She has been interning in the Applications Lab for three years with AptarGroup, Inc., the world’s leader in dispensing system solutions. This direct contact with the aerosol industry was the inspiration for her involvement with environmental protection and education. Her passion and interest is the intersection of international business and environmental accountability, especially how this is affected by the average consumer. In her spare time, Nina can be found reading, running, socializing with friends, or at her on-campus jobs as a teaching assistant and tutor. Barry is a senior chemistry major at Baylor University in Waco, Texas, minoring in environmental studies. He interned this past summer at the National Renewable Energy Laboratory (NREL) in Golden, CO through the Department of Energy’s Science Undergraduate Laboratory Internship program. At NREL, he researched organic photovoltaic devices and attempted to optimize the efficiency of devices using two specific polymers. He is passionate about renewable energy and its potential to decrease the world’s dependence on fossil fuels. He plans to pursue a career in photovoltaic research. In his spare time, he enjoys mountain biking, hiking, travelling, playing guitar, and playing basketball. Catherine King is a senior double major in chemistry and chemical engineering at the University of Alabama. She is passionate about the environment and "green" science; and currently works in Dr. Robin D. Rogers research group on developing green materials from chitin. She has spent two summers interning at the NASA Marshall Space Flight Center, where she worked under Dr. Sridhar Gorti in the materials lab ﻿on depositing diamond like carbon from methane plasma and on modifying fibers for use in SLS (Space Launch System). In her free time she enjoys going to concerts, travelling, and spending time with friends. Jade Hovet is a senior Chemistry major at Augustana College, SD. She is currently interning with POET ethanol, a Midwest based company focused on clean affordable alternatives to fossil fuels, where she “often gets to swap out her lab coat and safety goggles for a hard hat and steel-toed boots.” She previously interned with Health Diagnostic Laboratories in Richmond, VA. At Augustana College working under Dr. Barrett Eichler, she conducted research focused on using quantum dots and FRET to detect the hybridization of DNA which she presented at the national ACS meeting in New Orleans. Jade often volunteers as a speaker for teen girls about the importance of science in society today and how exciting it can be with her message, “Every Flower Needs a STEM.” In her free time, Jade enjoys painting, running and practicing yoga. Jade plans to pursue a career in science and environmental policy upon graduation. Rachel is a senior Biochemistry and Women's Studies double major at Hamilton College. She previously served as an ACS student delegate to the UN Climate Talks in Warsaw, Poland. 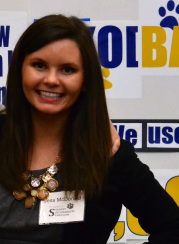 This year she will serve as a student mentor for the program at COP20 in Lima, Peru. Her passion lies in understanding how health and the environmental issues intersect with gender, race, class, and culture to impact policy decisions. Rachel’s current interdisciplinary research as a Hamilton Senior Fellow involves analyzing how scientific knowledge in the medical field can be of particular social consequence. In her free time Rachel enjoys her on-campus jobs as a teaching assistant, peer advisor and tour guide as well as playing IM basketball and acting as philanthropy chair of her sorority. 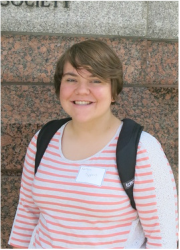 Kaitlyn is a junior Mathematics major and Sustainability and Environmental Studies minor at York College of Pennsylvania in York, Pennsylvania. She works as a math tutor on campus and also has an internship with Facility Services to work towards making YCP a greener campus. She is Vice-President of YES, the York Environmental Society, a student-run organization that attempts to get the student population more involved in the conservation of the environment. Her passion lies in learning more about the climate and climate change, specifically, how youth around the globe currently acts regarding climate change, and what the future holds based off of current youth group’s actions. She hopes to pursue formal post-graduate education in environmental studies. In her free time, she enjoys reading, spending time with friends, telling jokes, and going for walks.